Given the consistent increase in the number of proximity detec- tion systems (PDSs) being used in underground coal mines, it is critical to understand ways that PDS technology influences mineworkers' assessment of their environment and subsequent behaviors. Regardless of the particular PDS model, it is important to document these general responses to the technology and any changes in workers' ability to perceive, understand and make safe decisions on the job. More specifically, being able to anticipate certain behavioral responses may help minimize preventable incidents and guide future safety training and communication related to the PDS. 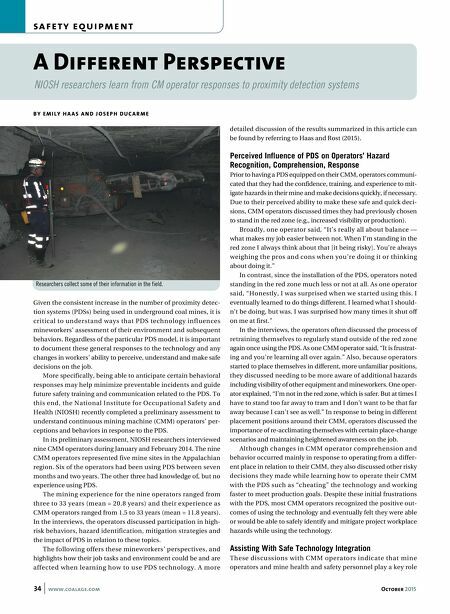 To this end, the National Institute for Occupational Safety and Health (NIOSH) recently completed a preliminary assessment to understand continuous mining machine (CMM) operators' per- ceptions and behaviors in response to the PDS. In its preliminary assessment, NIOSH researchers interviewed nine CMM operators during January and February 2014. The nine CMM operators represented five mine sites in the Appalachian region. Six of the operators had been using PDS between seven months and two years. The other three had knowledge of, but no experience using PDS. The mining experience for the nine operators ranged from three to 33 years (mean = 20.8 years) and their experience as CMM operators ranged from 1.5 to 33 years (mean = 11.8 years). In the interviews, the operators discussed participation in high- risk behaviors, hazard identification, mitigation strategies and the impact of PDS in relation to these topics. 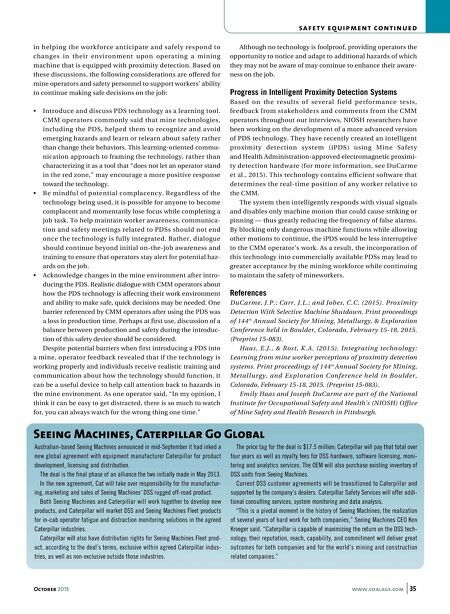 The following offers these mineworkers' perspectives, and highlights how their job tasks and environment could be and are affected when learning how to use PDS technology. A more detailed discussion of the results summarized in this article can be found by referring to Haas and Rost (2015). Perceived Influence of PDS on Operators' Hazard Recognition, Comprehension, Response Prior to having a PDS equipped on their CMM, operators communi- cated that they had the confidence, training, and experience to mit- igate hazards in their mine and make decisions quickly, if necessary. Due to their perceived ability to make these safe and quick deci- sions, CMM operators discussed times they had previously chosen to stand in the red zone (e.g., increased visibility or production). Broadly, one operator said, "It's really all about balance — what makes my job easier between not. When I'm standing in the red zone I always think about that [it being risky]. You're always weighing the pros and cons when you're doing it or thinking about doing it." In contrast, since the installation of the PDS, operators noted standing in the red zone much less or not at all. As one operator said, "Honestly, I was surprised when we started using this. I eventually learned to do things different. I learned what I should- n't be doing, but was. I was surprised how many times it shut off on me at first." In the interviews, the operators often discussed the process of retraining themselves to regularly stand outside of the red zone again once using the PDS. As one CMM operator said, "It is frustrat- ing and you're learning all over again." Also, because operators started to place themselves in different, more unfamiliar positions, they discussed needing to be more aware of additional hazards including visibility of other equipment and mineworkers. One oper- ator explained, "I'm not in the red zone, which is safer. But at times I have to stand too far away to tram and I don't want to be that far away because I can't see as well." In response to being in different placement positions around their CMM, operators discussed the importance of re-acclimating themselves with certain place-change scenarios and maintaining heightened awareness on the job. Although changes in CMM operator comprehension and behavior occurred mainly in response to operating from a differ- ent place in relation to their CMM, they also discussed other risky decisions they made while learning how to operate their CMM with the PDS such as "cheating" the technology and working faster to meet production goals. Despite these initial frustrations with the PDS, most CMM operators recognized the positive out- comes of using the technology and eventually felt they were able or would be able to safely identify and mitigate project workplace hazards while using the technology. Assisting With Safe Technology Integration These discussions with CMM operators indicate that mine operators and mine health and safety personnel play a key role b l a st h o l e d r i l l i n g 34 www.coalage.com October 2015 sa f e t y e q u i pm e n t B Y E M I L Y H A A S A N D J O S E P H D U C A R M E A Different Perspective NIOSH researchers learn from CM operator responses to proximity detection systems Researchers collect some of their information in the field.